What is Fire Glass and How Does it Work? 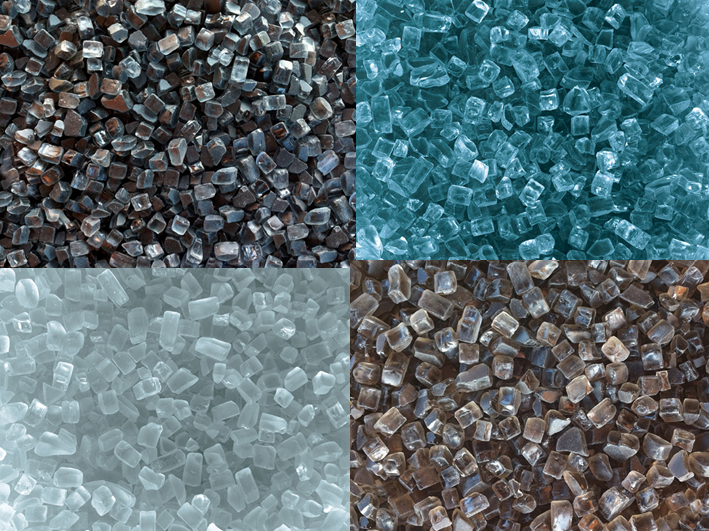 Fire glass is composed of small bits of tempered glass that is used in fireplaces and fire pits. The fire and ice combination quickly became a fast growing trend for homeowners and designers since its introduction in the mid 2000’s. Since then, it has been much more common to see fire glass used in fire pits, tabletop fireplaces, and fireplaces. Fire glass serves two purposes; aesthetics and functional. Fire glass became a popular alternative to fake ceramic gas logs that kill the natural ambiance of a dancing flame. Exposed gas lines create an awkward visual that makes it apparent that you are not experiencing a real flame. Fire glass provides a decorative way to cover up gas jets with beautiful pebbles and crystals that not only look great but increase heat radiation by up to 4 times! Fire glass pebbles are available in a variety of shapes and colors that can create a glowing focal point in your backyard or inside the family room. Fire glass is put through a special treatment that allows small pebbles to come in direct contact with hot flames without melting. Tempered glass is a type of safety glass that is commonly used for a variety of applications including windows, computer screens, and shower enclosures. Learn how you can improve heating efficiency with tempered glass windows by reading this. Fire glass is made out of recycled glass, making it a brilliant repurposed product that is original and authentic! Because it has been tempered, fire glass won’t melt, soot, or explode. It’s safe to use and does emit any harmful byproducts into the air. You can’t use regular untreated glass in the same way unless you plan on practicing your glass blowing skills. Regular glass will create a nasty odor and could explode. Fire glass only costs a few dollars per pound so please don’t take any shortcuts! Fire glass looks amazing, leaves no mess, and it’s mesmerizing! Purchase blue, bronze, black, and white fire glass here! Fire glass usually comes in the shape of small pebbles or in the form of crystals. Fire glass crystals are made to simulate the look of diamonds and other special cut stones. They are essentially the same thing, merely represented in a different shape. Here’s a link where you can buy fire glass for outdoor fire pits. Fire glass crystals sit atop the flame, usually in a tray that is designed to hold them. 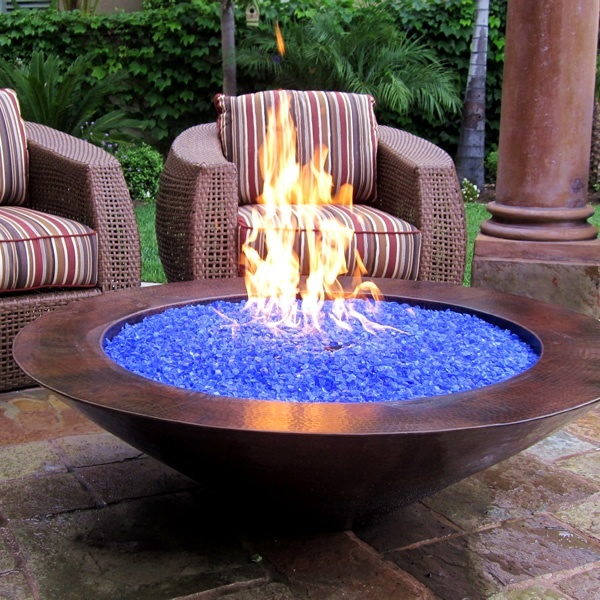 You can find examples of tabletop fire pits that use fire glass by visiting this page. Simply pour your fire glass pebbles evenly into the pit and turn on the gas. The translucence of fire glass creates quite a spectacle as it shimmers and glitters under the night sky. Flames rise up around the glass in a way that makes it appear as though the glass pebbles are on fire. Fire glass pebbles are available in a variety of colors like orange, blue, green, and yellow to set the tone that is in accord with your décor. This video shows you what Fire glass looks like when the flame is going with different colors including Aqua, Onyx, and Topaz Gold! Fire glass can be used indoors or outdoors, with gas or propane fire pits. How much fire glass you need depends on the diameter of your fire pit and the depth of fill you would like. 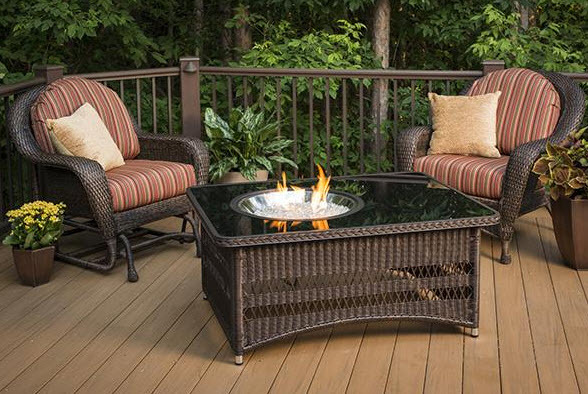 Determine the volume of this space and calculate how many pounds of fire glass you’ll need for your fire pit! The The 48” Naples Outdoor Fire Pit Table. On sale for $949.05. The 48” Naples Outdoor Fire Pit Table. On sale for $949.05. Portable Fireplace.com is your source for indoor and outdoor heating solutions. Find the perfect outdoor fire pit that will house your fire glass by checking out this page! We offer our Lowest Price Guarantee that ensure that you’re getting the best deal! Megan Meyer is an interior design consultant focusing on crisp modern interiors with a tinge of retro styling. She offers design and consulting services for residential and commercial spaces. Follow her for fool proof design tips for everyday homeowners. This entry was posted in Fireplace Accessories by admin. Bookmark the permalink.